A short paper on demography by Benjamin Franklin consisting of 24 numbered paragraphs, “Observations Concerning the Increase of Mankind, Peopling of Countries, Etc. ” (1751), provides interesting insight into the thoughts of one of the most astute and discerning of the Founding Fathers. I will focus primarily upon Franklin’s demographic insights and perceptions of race and whiteness, though he also discussed economics. In quoted passages I have modernized archaic capitalization and italicization. 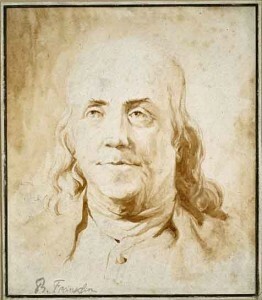 Franklin was born in Boston in 1706 to tallow chandler Josiah Franklin and his wife, Abigail née Folger. Josiah was born in England; years later Franklin visited his ancestral home and wrote about it in his autobiography. (To see the names of Franklin’s ancestors, click here . Click “Show” if the box is unexpanded.) Abigail was born on Nantucket Island to Puritan immigrants. Franklin’s extensive writings are characterized by empiricism and specificity rather than abstract speculation. Although his longest single text is his short, masterful Autobiography, the definitive edition of The Papers of Benjamin Franklin  (Yale University Press, 1959–2011), 40 volumes long and counting, has now reached the year 1783—when he was still a diplomat in France. Significantly, the establishment of a small, vastly reduced ethnostate effectively constitutes a loss of territory in Franklin’s sense. Theoretically preferable would be Samuel Francis’s proposed “reconquest” by a long march through the institutions, a William Pierce-style revolution effectively aimed at reconquest, Pan-Nationalism , or a Richard McCulloch-type ethnostate incorporating major elements of an existing state (see McCulloch’s subsection “Thirteen Principles of Racial Partition;”  he has devoted decades to thinking carefully about this problem). Franklin’s hostile attitude toward these people mirrored Tory-Anglican opposition to their admission to England at the time rather than the welcoming stance of the Whigs .